Libbie Havens doesn’t need anyone. She’s fine on her own. When she chances upon the secluded house on Cub Creek she purchases it. She’ll show her cousin Liz, and other doubters, that she can rise above her past and live happily and successfully on her own terms. Libbie has emotional problems born of a troubled childhood. Raised by a grandmother she could never please, Libbie is more comfortable not being comfortable with people. She knows she’s different from most. She has special gifts, or curses, but are they real? Or are they products of her history and dysfunction? At Cub Creek Libbie makes friends and attracts the romantic interest of two local men, Dan Wheeler and Jim Mitchell. Relationships with her cousin and other family members improve dramatically and Libbie experiences true happiness—until tragedy occurs. Having lost the good things gained at Cub Creek, Libbie must find a way to overcome her troubles, to finally rise above them and seize control of her life and future, or risk losing everything, including herself. One wrong turn and Libbie was lost. The narrow country road dipped and curved through mile after mile of roadside forest, but if she kept driving south through Louisa County, she’d reach Interstate 64 eventually. She was traveling to Charlottesville to visit her cousin Liz and, given her mood today, eventually was soon enough. The trees were closely-packed, but their branches were bare. Only the hollies and evergreens had color. As she rounded a sharp bend the vista opened and a horse farm came into view. Clean white fences stretched across the pastures. A huge barn, faded red and picture-perfect, graced the crest of the hill. Before her foot hit the brake, she was already grabbing her camera. The shoulder was narrow and the ditch was deep. Libbie angled the car across the oncoming lane to the far side. The tires hit the wide, grassy verge with a short, heart-jolting skid. When her car stopped, the bumper was kissing the black metal of a For Sale sign—now a tilted For Sale sign. A close call, but no harm was done. Libbie held her breath, then slowly released it. The lawn sloped upward to a two-storied white house. She lowered the car window a few inches. The air was cool, but very mild for February. She closed her eyes and breathed in the sharp, clean smell of pine tags and damp earth. Tall trees framed the wide yard and continued around behind the house. The house was old, but its lines were straight and true. Add that gorgeous view of the pastures across the road and this was a win-win for whoever lived here, if anyone did. No porch furniture. No personal objects in the yard. Was it vacant? A car was parked at the top of the driveway with a sign on the driver’s side door. Libbie opened her door. She saw below that the tires had gouged the soft earth and mangled the turf. When she looked up a thin man with white hair was standing on the porch. He descended the steps and strode down the hill. The ruined grass was an indictment—undeniable proof of her carelessness. She exited the car and stood, waiting. His eyes settled on the car. It was dinged and dented and nothing special, then on her person, again nothing special. She brushed at her blouse wishing the wrinkles away. When she reached up to tuck her long, unruly hair behind her ears she realized she was still holding the camera. “Ma’am, you okay?” The man squinted and the crow’s feet around his eyes deepened. His expression and tone were friendly. Obviously, he wasn’t angry. She relaxed. “I see.” But she didn’t. He spoke about these people as if she should know them, as if she should care about them. Libbie clutched her camera, feeling stiff again and glad to have somewhere to put her hands. A subdivision. The thick woods, the stately house and the blessed privacy—it could be devastated in an instant. Once gone, you could never get it back. She knew that personally. Anxiety slapped her across the face. He pulled a paper flyer from a tube attached to the sign and handed it to her. An argument was raging full force in her head. She tried to shut it down by ignoring it. “Aren’t you chilly, Ms. Havens?” Mr. Graham was wearing a light jacket. “My sweater’s in the car.” She put the camera on the back floorboard, grabbed her sweater and put it around her shoulders as they walked up the slope. The trees on either side stretched around the property like a barrier to the world. No, you don’t want it. You live in the city and always have. Why would you want an old house out here in the woods? “It’s old,” she said, as she followed him up to the porch. Just beyond the threshold Libbie paused and placed her hand flat against the bare wall. She held her breath and waited. A sense of wellness and a gentle flush of peach and gold, softly warm, flashed from her hand to her head. The sensation and colors might only exist in her imagination, as some insisted, but they reassured her nonetheless. She walked further into the foyer. Oddly enough, she felt happy. The city, with its constant noise and crowds, confused her, but it had never occurred to her that the solution was to live in the middle of nowhere. Crazy idea or not, she found herself actually examining the interior of the house. The foyer or hallway ran directly back, past the stairs on the right. On either side of the entry way were large, square rooms with many windows. Lots of light and no unexpected shadows hiding in the corners. The wood floors had scarring and uneven wear. The walls were grim, begging for fresh paint and wallpaper stripping. Fireplaces anchored each end. Mr. Graham continued speaking as she went into the kitchen. It was old, with white porcelain appliances and faded linoleum, but it was usable. She looked in the fridge and rubbed at a spot on the stovetop where the enamel had worn through. They walked into the dining room and then through French doors to a screened porch furnished with green wicker furniture. He eyed the scuffed and stained sneakers, her non-designer jeans, the wrinkled shirt and the hair that curled and fought to do its own thing. She saw the spark in his eyes when he decided where to pigeon-hole her—eccentric. She didn’t mind. That was kinder than most. When it came to people in general and some in particular, Libbie didn’t like them any better than they liked her. But eccentric? That she could do, and with style. A day or two to think it through? Already, the internal pressure was easing off. He pointed toward the house and then down the road. An old concrete bridge was half-hidden by the curve. He left. Libbie stayed. She wanted to see the place alone. She stared at the deserted road because she knew that when she turned back toward the house, she’d see nothing special, just an old house with a patchy lawn. The flaws would be obvious. This was a big decision—a huge, potentially life-altering decision—but no worries. She’d walk away from this like she did from every commitment. She did, however, want to know what she was walking away from. It looked even better. The house sat atop that slope like a crown. The white clapboards, brushed by the late afternoon light, wore a sheen of burnished gold. Libbie snapped a few photos of the house and the view across the street, then she slung the camera strap over her shoulder and walked around to the back yard. The kitchen door was locked, but the hook on the screened porch door wasn’t secured. She settled for a sit-down on the porch swing. The swing’s back was curved. She rested her head against it. The narrow, tight-fitting boards overhead were painted light green. The porch floor was gray and the wicker furniture was dark green. Unseen birds chirped. A squirrel ran across the yard, then paused by an oak tree to nibble on a tiny something. She tried to empty her mind, to leave it open to sounds, smells, emotions—whatever might tell her if anything negative lingered here. She waited, growing more relaxed. Her breathing slowed. It snapped directly behind her. A branch? A stick? She jumped. The swing swayed wildly. She struggled for balance. Had she dozed off? Apparently. The noise may have come from behind her, but the voice came from the other side of the porch. A man, some sort of cop judging by his uniform, was standing a few yards away. Further back stood another man, not in uniform, but the details were softened by the screen between them. “Yes, fine. You startled me. I’m taking a look at the place. It’s for sale.” He already knew that, of course. She sounded foolish. Her arms prickled. Libbie rubbed her hands along her sleeves. Had she truly heard that noise? That snapping sound? She resisted turning and instead focused on dealing with the men in front of her. The other man nodded. They walked away, turning the corner of the house. As soon as they were out of sight, she spun around to stare at the woods nearest the porch. There was nothing to see and nothing to explain the noise. The trees and undergrowth were winter-lean. Nature itself must have caused the sound and it had gotten caught up in a snippet of dream while she napped. She checked the time on her phone. Too late now to make Liz’s house by suppertime. Liz would be annoyed, but she’d get over it. Libbie’s brain was full of things to consider, but her anxiety had abated along with the contrary voices in her head. Her cousin usually meant well, but they were very different people and sometimes her opinions weren’t what Libbie viewed as supportive or encouraging. Libbie wanted to think this decision through on her own. The spell of the house on Cub Creek lessened with distance, allowing common sense to regain the upper hand. By the time she neared home she regretted her impulsiveness, but Mr. Graham was a true gentleman. He would return her deposit. The whole episode did make her think seriously about moving on. Whether to Cub Creek or elsewhere, the need to move away from here had become clear. Her neighbor’s over-large pickup truck was parked smack on the line between their assigned spots leaving her little space between it and the SUV on the other side, forcing her to squeeze her car in and then squeeze her body out. Typical thoughtlessness and arrogance. By morning, her car would have fresh dents on both sides. She’d left the exterior light burning by the door, and there were other lights, including street lights, and her house key was in hand and ready. She slipped inside, locked the door and dropped her bags on the chair with relief. She poured a soda, grabbed a few oatmeal raisin cookies and plopped down on her flowered, overstuffed sofa to call Liz. Liz’s voice was steady and low. Gentle. That’s how Libbie knew she was angry. Libbie closed her eyes and slumped back against the sofa. She kicked off her shoes and pulled the rose-colored sofa throw down over her legs. A loud bang from next door—likely the Duncan’s front door slamming—rattled the picture frames on their common wall. Sure enough, someone started banging on her door. Libbie tried to close the door. Bruce’s face turned purple and seemed to be swelling. She remembered the phone still in her hand. She stepped back and put the phone to her ear. Bruce grabbed the door knob and pulled it closed. Libbie didn’t expect to hear more from him this evening. She put the phone down a little saddened by the victory. Bruce left, yes, but why hadn’t she simply moved her car so he could get into his truck the way he wanted to? A moment of her time would fix a problem she hadn’t caused but had to deal with because of rude and inconsiderate people. At least, it would fix it for the moment. But she wouldn’t do that because bullies were bullies. If they got away with it once, there’d be no end. She turned in a big circle taking in the living room and dining area of her townhouse. After five years she hadn’t finished hanging pictures, including the photo collections. She’d purchased no knick-knacks nor put up any curtains. Why? Because she didn’t need more crap. She already had a bucketful from neighbors who weren’t neighborly in a townhouse that was uninspired. In a city crammed with people and traffic, she was alone. Couldn’t even manage to get along with people on the job, time and again. So, no job. But where was the incentive? She didn’t need the money and the jobs were a bore. Upshot? If she was going to be alone, then why not do it her way and on her own terms? She remembered the golden glow of the house on Cub Creek. They’d say she’d lost it again. Her mind, that is. The internal struggle followed her to bed. She spent a restless night at the mercy of thoughts, both eager and anxious, chasing around in her head, shrill and beyond control. She rose early, in truth giving up on sleep and glad to see the morning. She was in the kitchen with a cup of coffee in hand when the cell phone rang. She knew it was him before she answered. That’s how fate worked. Percussion noises reverberated through the shared kitchen wall. Clanging and banging pots and pans was Mrs. Duncan’s morning ritual. Presumably she was cooking, but who could tell? They’ll say you’re crazy, a voice in her head whispered. If living as she chose showed she was crazy, then they were right and they were invited not to share it with her—her crazy life. A sudden cold snap—but the air was fresh and bracing and proved the furnace worked well. The house had passed inspection. She held the keys. Front door, French doors and back door. Each had a knob lock and a deadbolt. Liz was coming. Libbie saw the house through her cousin’s eyes. Scarred floor. Dingy paint. Faded and stained wallpaper. What did she, Libbie, see? Numerous windows, nature all around and a picturesque horse farm across the road. The moving van would empty her townhouse in the morning and deliver the furniture and boxes here the next day. She didn’t think she had a lot of stuff, but boxing it up had taught her otherwise. Most of it was junk and she would’ve tossed it, but then she’d have to buy more junk to replace it. The exception was the old desk and armoire. They weighed a ton and were antiques with more than sentimental value. They would grace the study. Liz’s midnight blue Benz pulled up the driveway. She let it idle for a minute before cutting off the engine and getting out. Through the window, Libbie saw her staring at the house. She knew Liz was asking herself if this could possibly, in a million unlikely years, be the place. With the palm of her hand against the window glass, Liz eased the car door closed, but her eyes kept moving, taking in the house, the woods. Libbie shrugged her shoulders to ease the taut pinch growing in the back of her neck. By the time Liz reached the porch, Libbie was waiting there to greet her, glad of the fresh cool air against her cheeks. “Not fair. You know I love to visit you, Josh and the kids.” Libbie opened the door and stood aside. “I like your new cut. Maybe I should get this mop of mine trimmed.” She gathered her long curly hair into a twist and held it behind her head. Until now, they’d kept the banter light despite the emotion behind the words, but at this rate, it wouldn’t last. “Barry Raymond? Why?” She shook her head. Libbie crossed her arms and stared through her cousin, not wanting to see her, wishing she’d kept her words to herself. They looked at each other in shared relief. Libbie knew her cousin didn’t enjoy the tension either. She shook it off and waved at the next room. “But you don’t have any common sense,” Liz added. Liz had been staring out the kitchen window. Now she moved into the dining room to stand in front of the multiple windows along the side wall. Doubt was in Liz’s voice and its shadow was in her eyes, but she moved on, heading to the front door. “What do you think?” She waved her arms around. “Well, no matter what, one thing you can count on is me. I’ll be rooting for you.” With a smile that was more business-like than chummy, Liz tossed her head and turned away. Again, as if by appointment, her hair settled back into place, framing her cheek and jaw. Liz. Perfect Liz. She stepped lightly down to the sidewalk. Perky Liz. Libbie loved her cousin and maybe envied her a little too, but perky? No, thanks. Liz waved through the car window and backed onto the lawn, then turned and drove down to the road crunching gravel under her tires as she went. Libbie lingered, determined to erase the doubts Liz had expressed, her own doubts, and any negativity from the premises. She wasn’t stupid. She knew she might end up regretting this decision. 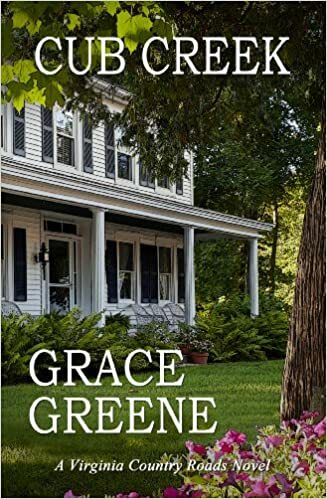 As Libbie left the daylight was fading and the sunset hinted of lavender and red as it bloomed above the horse farm and splashed some of its color across the front of her house. Her house. She tried to imagine how it would look with her furnishings filling it. She was ready for a change and this was a big one. A neighbor was standing on the sidewalk watching as Libbie pulled into her parking space. Not Bruce this time but his wife who was not exactly his better half. Had he stationed her there to monitor the parking? No. Their pooch was nearby pooping in Libbie’s grass. Libbie waved and smiled broadly. Tomorrow morning the For Sale sign would go up on this little patch of lawn. They’d be glad to see her gone, but that worked both ways. Maybe they could have a neighborhood celebration in the parking lot and she’d be the absentee guest of honor.